Hiya guys! Today's post is an extremely important one on so many levels. I am a reserved person, but I do feel I share a lot of my personal life through my nail blogging. I love feeling like I am making a connection through something I am passionate about. Now to make it simple let me start off by saying I have Hydrocephalus. This brain disorder is the build-up of fluid in the cavities deep within the brain. There is treatment (surgery) to ease with the pain, ultimately however this disorder does not have a cure. Currently I remain untreated and will not be seeking out the surgery any time soon. This is a personal decision I made a long time ago, but that does mean it is easy. Thankfully I have a wonderful support system and without them I definitely wouldn't be able to stick it out with my decision. 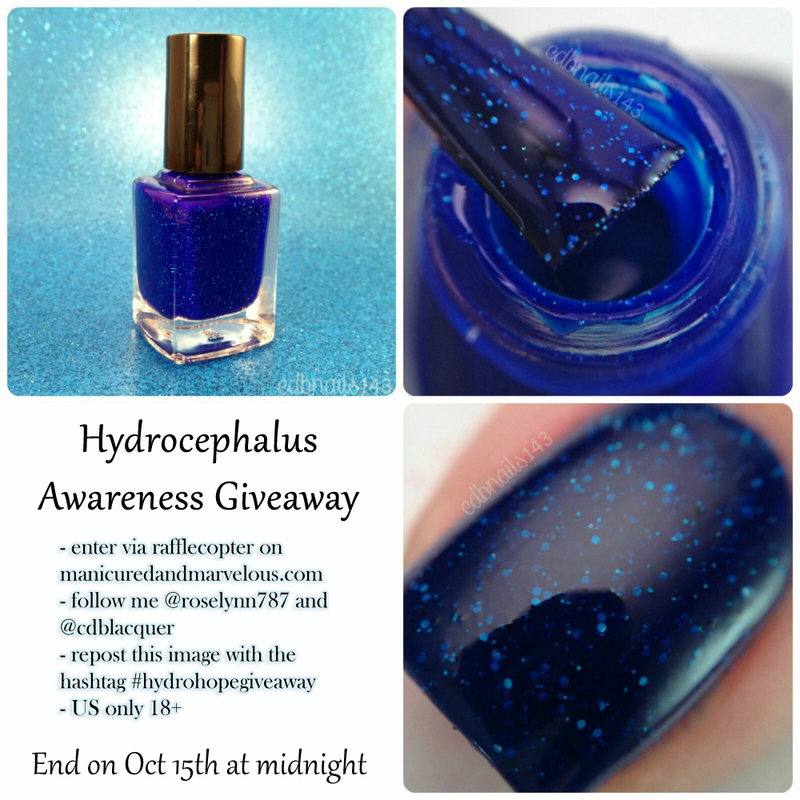 Cheyenne from CDBNails is one of my very best friends and she has taken the time to write a beautiful post on her blog dedicated to Hydrocephalus Awareness. I highly encourage you to check it out, her words are very heartfelt and it brought me to tears. You can read the post here: http://www.cdbnails.com/2015/09/hydrocephalus-awareness-month-bestie.html. Yes, I'm back to 'nubs' sadly. I have definitely not marbled in a long time and it was quite challenging to do so. The white polish I had was awfully thick and was not helpful at all. Dang you! But the blue is freaking gorgeous and you may recognize that one as Sia from Zoya. 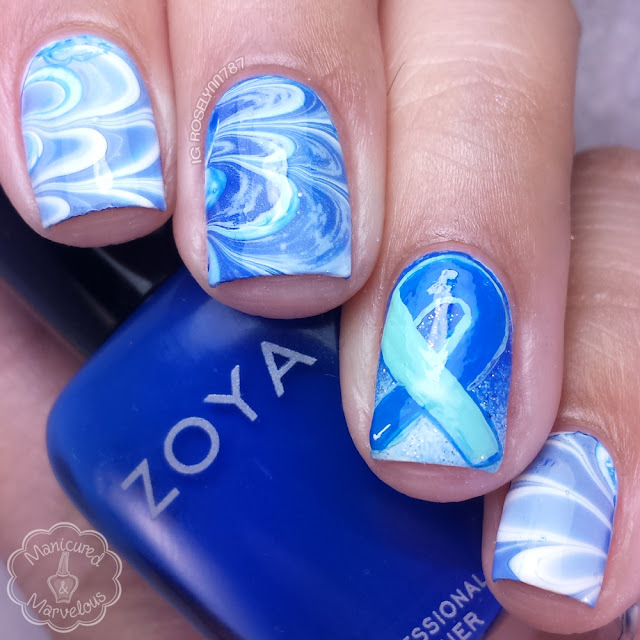 The awareness ribbon was freehanded using just acrylic paint and a detail brush. Cheyenne is also the maker behind the indie brand CDB Lacquer and was kind enough to create a custom for me. 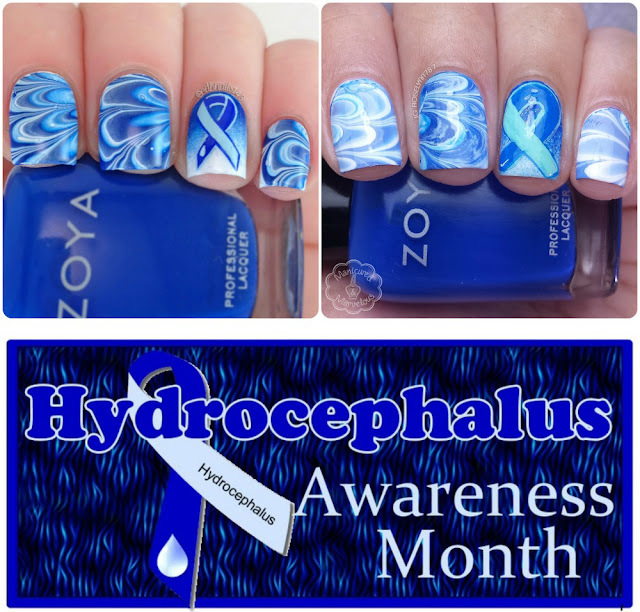 This is called Hydro Hope and it was created with Hydrocephalus Awareness in mind. You can win it simply by entering below using Rafflecopter, only your email is required to make a valid entry. Of course, you can have more chances of winning by entering the info for the other fields and reposting the image up above on Instagram. This giveaway is US only and you must be 18 years or older to enter. If you have any questions or concerns please let me know. I wish I could give you a hug! I know hydrocephalus really well. When I was a kid my parent's good friends had a baby born with it and they explained to us what the condition was. This baby turned into an amazing young woman that I had the pleasure of seeing grow up, helped take care of, and taught art lessons to. She was in her early 20s when she passed last year due to some other health complications. I think about her often. Thank you for sharing your story. Thank you for sharing. I do know the condition, although up until now, I did not know anybody that was affected by it. Big hug! I've never heard of this condition. Big big hugs!! Gorgeous mani! I bet it took a lot of courage to post this. I'm glad you have a support system and I'll be sure to check out the other blog post! Thank you for sharing your story and big big hugs! Your mani is beautiful and I'm sure it will go a long way in helping to spread awareness! I had no idea that you suffered from this! Thanks for sharing information about the illness - I did not realize this continued to affect people throughout their lives. Beautiful awareness mani's. Thank you for sharing with us! I've never heard of this condition before. Thank you so much for sharing. 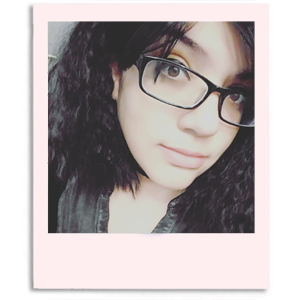 I know it probably took a lot of courage to post this. Very beautiful mani both of you! I've heard of this but didn't realize the severity of it. Love your mani bringing awareness. My heart goes out to you. I've never heard of this, but thank you for bringing awareness to it. You are very gracious and brave in the way you've chosen to face this disease and raise awareness! And that collab polish is just stunning! Hugs! My cousin just turned 17 with hydrocephalus and she's basically my hero <3 I'm so happy to see awareness on this!